The Supreme Court really ought to hear this case, on a number of legal issues (not factual). (1) Is the agreement of 90% of the creditors valid if they are under threat by the government? (2) Is a price fair if it exceeds the liquidation value but is a giveaway to the buyer because it is much less than he would have been willing to pay? If the Supreme Court does not hear this kind of case, these important issues may never be brought up. It is no excuse that the Court is being rushed. These cases are urgent by their very nature, and we are going to see a lot of them, because we are in a recession with government bailouts. And they are cases of great public importance, where there should be lots of input from scholars. 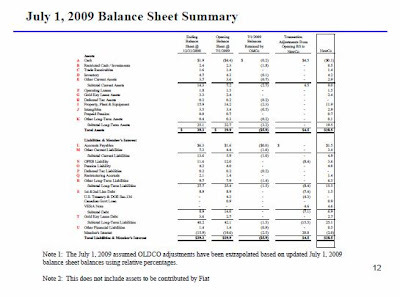 I found the balance sheet estimate, finally, for the Chrysler deal. I’ve added them to this post as a picture file. wrong, though, as I’ll explain below. since they might accept a money-losing deal. that would yield less than $2 billion. the most accurately measured in accounts. They are $7.2 billion. -$.9 billion going to NewCo. The big item is Property, Plant, and Equipment, at $14.2 billion. liquidation than if they were run as a going concern. concern up to $10.1 billion. I’m an economist thinking of writing an academic article on an issue in this case: whether the $2 billion price should have been allowed by the judge. This seems to me crucial. The judge answered “yes” under the reasoning that any price above the liquidation value of about $1 billion was reasonable. He didn’t cite any judicial opinions for that reasoning. Was this a case of first impression for that point? If we accept his reasoning, then whether the other creditors were pressured by the government is irrelevant, since the price they agreed to was reasonable. 1. The legal rule ought to be that a fair price in a 363 sale is a price that a Collateral Trustee acting faithfully to maximize creditor value would get. 2. In a 363 sale, that price is never the liquidation value. If there is a competitive market, it is that market price. If there is just one potential buyer, it is the result of haggling between a Faithful CT and that buyer. 3. The result of such haggling would ordinarily be somewhere about halfway between the liquidation value and the maximum amount the buyer would be willing to pay. 4. In the Chrysler sale, such a price might be as high as $13 billion, halfway between the $1 billion liquidation value and the $25 billion book value of the assets. 5. Since $2B is a lot less than $13B, the Collateral Trustee was not Faithful. 6. The Collateral Trustee not being Faithful is good evidence that the 90%+ agreement by creditors was pressured. The “fair price” point would seem to be important to lots of bankruptcy cases.